Using Kepler Telescope transit data of planet “b,” scientists predicted that a second planet “c,” about the mass of Saturn, orbits the distant star KOI-872. This research, led by Southwest Research Institute and the Harvard-Smithsonian Center for Astrophysics, is providing evidence of an orderly arrangement of planets orbiting KOI-872, not unlike our own solar system. Detective astronomers have discovered at least one unseen alien planet, and possibly another, around a distant star by observing the odd behavior of a planet already known to orbit the same star. The newfound planet has about the mass of Saturn and orbits its host star once every 57 days. It was revealed by its gravitational effects on the previously known planet around the parent star KOI-872. The find is an apparent validation of what scientists call the transit timing variation method of finding extrasolar planets. The idea of looking for oddities in a main planet's transit of its star to search for other planets was suggested in 2005, but "this is the first occasion where there is great confidence that the method works," said astronomer David Nesvorný of the Southwest Research Institute in Boulder, Colo., who led the new study. In fact, when the researchers looked in more detail at the system, they found signs of yet another planet, one only a bit larger than our own world. This "super-Earth" is likely circling very close to the star with an orbital period of 6.8 days. The first look at data from NASA's planet-hunting telescope Kepler had identified only one planet around the star KOI-872. But a closer inspection by scientists outside the Kepler team revealed telltale signs of an extra planet. As part of its systematic search for alien planets, Kepler looks for stars whose brightness dims periodically — a signal that something, presumably a planet, is passing in front of it and blocking its light. 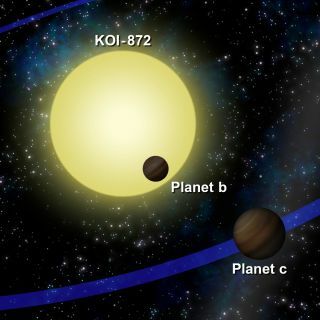 The Kepler team identified a light dip in KOI-872 (KOI stands for "Kepler Object of Interest") and attributed it to a planet that orbited the star every 34 days. However, that timing appeared to vary by a few hours. "The planet should show transits equally spaced, which is not the case," Nesvorný said. "Sometimes the transit is two hours late, sometimes two hours early." Scientists analyzed Kepler telescope data and identified KOI-872 as a stellar system where measured transits of a planet orbiting the star show large time variations (the shifting bumps in image) – signs of a hidden companion about the mass of Saturn orbiting the host star every 57 days. Nesvorný and his team are now combing through the wealth of Kepler data for signs of exomoons — moons orbiting alien planets. So far none has been found. "It mainly depends on if you can have really large moons, because if the moon is small, it wouldn't change transits too much," Nesvorný said. "At some point the first exomoon will be discovered. My guess is it will happen within a few years from now." After the Kepler team runs its main analysis of data, it releases the data publicly to any scientists who want to study it. "This is an enormous amount of data, so there's no way the Kepler team would have time to look at everything," Nesvorný said. "I think there are many more additional gems waiting to be discovered in the data set, either by the Kepler team or by scientists not related to Kepler." The new discovery is detailed in a paper published in the May 11 issue of the journal Science.